Dec. 13, 2018 – “It was either just run the other equipment into the ground and walk away, or dive in head first,” says Kris Heideman, vice-president of Eganville, Ont.-based Lavern Heideman & Sons Lumber, about the company’s recent $17 million upgrade. Heideman and his father, Eddie, president of the company, have invested $17 million in modernizing the mill to boost production and efficiency. Previously, the site had two sawmills: a bandmill for larger diameter logs and a scragg mill for logs nine inches and under. Now, the company has expanded to accommodate a new large-log line, as well as dry kilns and space for their planer mill. The company is no stranger to upgrades. The family-owned mill, which Heideman’s grandfather, Lavern Heideman, began in 1974, building a large log circular mill in 1976, added a scragg mill in 1997. In 2005, they upgraded the circular mill with a resaw and, in 2014, Heideman acquired Pembroke, Ont.-based International Lumber. 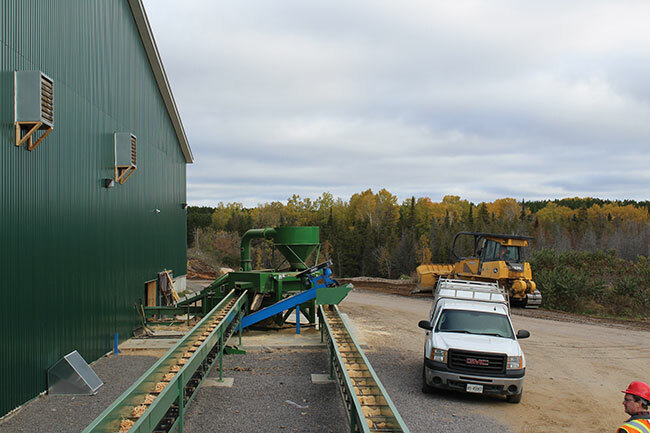 Now the mill produces white pine speciality products, drying, dressing and packaging the lumber themselves. 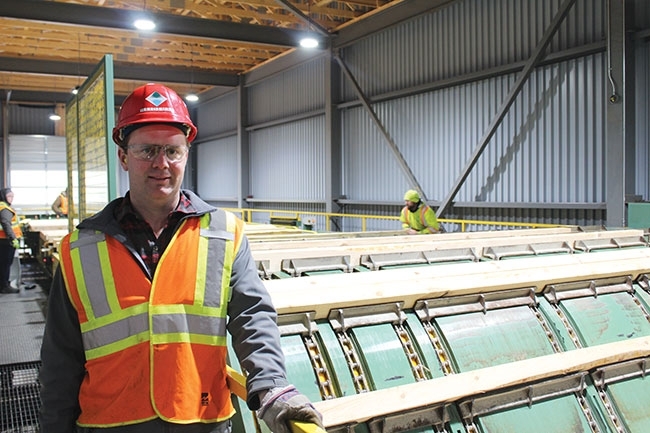 “We’re probably about 30 per cent white pine production at the sawmills,” says Heideman. This goes through the Pembroke operation, and the company also buys white pine from other mills in the area for their speciality products. Red pine timbers remain their biggest market, with the lumber going up the road for pressure treating at CanWel Pastway. Another 30 per cent of their production is hardwood oak and maple, marketed by C.A. Spencer. So where does their fibre come from? The red pine is harvested within a 300-km radius, where Heideman manages some of the land, continuing a red pine forest management program Eddie started years ago. Now they harvest with two new 911 Komatsu processors on rubber, one Cat 501 buncher with a processing head and two Puma forwarders. A contractor who works in the Peterborough and Lindsey, Ont. area also cuts for them. Like the cutting process, the small-log line – a TS Manufacturing twin-saw circular scragg – has not changed. But the original 1976 large log headrig line is gone, and the building is in the process of being torn down. It will be completely gone by next spring. Now there is a new large-log line in the same building as the small-log line, and a new building has been constructed to house a sorter and stacker. The new line starts with a brand new Nicholson R2 debarker that handles logs up to 36 inches. The logs then go to a TS Manufacturing double-cut bandmill slant carriage with an Autolog carriage optimizer and controls, and then to a TS trimmer line and TS edger. The Autolog carriage optimizer provides full 3D scanning and determines the opening face. It is followed by a resaw – the only piece of equipment from the old mill still in use. The line also features a three-saw edger by TS. Lumber is then trimmed on Canadian-style trimmers, where, at each trimming station, “the trimmer can determine the grade if we want, depending on what we’re doing and what species,” says Heideman. The two lines then merge onto one outfeed through a two-level alternating lug system, which identifies the source of each lumber piece as it is loaded into a lug, and tracks it for species throughout the process, thanks to the programming logic controllers (PLC). “For example, we could do red pine on one line and oak on another; they merge together to feed into the one sorting and stacking line,” Heideman explains. Additionally, Heideman can set the ratio from mill to mill, as well as change the speed. “So if we’re sawing maple on the large-log line, we’ll probably go on two lugs from the maple line to three lugs from the red pine small-log line,” he elaborates. 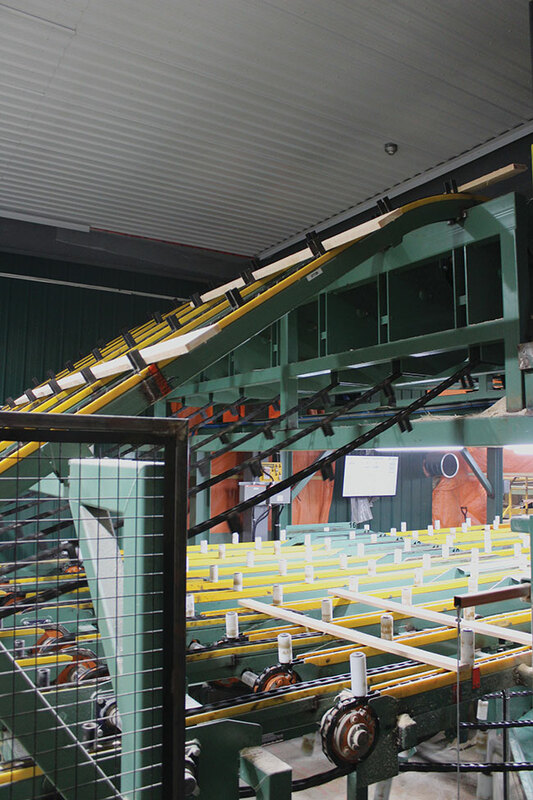 The lumber goes into a Piche 123-bin j-bar sorter and stacker, which features Logitech software and allows for more production flexibility and labour savings, since manual pulls are now 100 per cent gone. Complete lumber bins then travel through an unscrambler designed to manage the range of products made at the mill, from small boards to large squares. This includes adjustable riders built into the ladders that can accommodate all sizes. Lumber is stacked using manual sticker placing, completing a straightforward flow. However, designing the flow was not as simple as it sounds. The sorter and stacker now sits along the side of the mill, 700 feet long from end to end. The expanded mill also features all new, well-plumbed residual handling systems, including a Precision chipper and vibrating screen for chips that go to a local Roseburg MDF mill, as well as sawdust that goes to the MDF mill and bio-oil producer Ensyn. Finally, two new Cathild direct-fired propane kilns handle drying about four million board feet of high value white pine and some red pine from the sawmills. They are very efficient, Heideman notes, and include EBI high-efficiency dry-kiln duty motors. Additionally, Cathild, like the other manufacturers of the mill’s equipment, provides remote service if they encounter problems. Consequently, running fibre and opti-cable throughout the site was another big part of the investment. As mentioned, the new large log line at Lavern Heideman & Sons features a TS Manufacturing double-cut bandmill slant carriage with an Autolog carriage optimizer and controls. 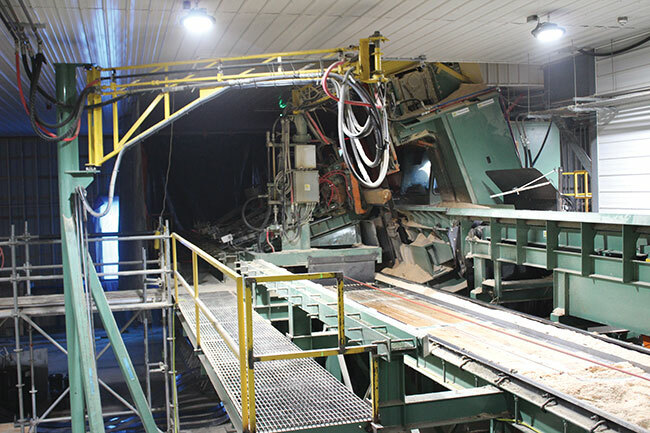 Heideman turned to Autolog for the carriage optimizer after using the manufacturer’s grade tally system and visiting a mill that used the optimizer. When asked how their carriage optimizer works at the mill, Autolog’s Gilles Gauvin explained that it features multiple laser lines spaced six inches apart for a profile reading at one-inch intervals along the length of the log. Snapshot or continuous scan function modes are available with up to 120 scans per second. Gauvin says the optimizer features the smallest laser line spacing in the industry, fits any mechanical configuration and uses True Shape modelling. A user-friendly interface and simplified architecture makes it easy to learn the system. “We were very impressed how Autolog was willing to develop a cost-effective custom solution that met our very specific requirements,” Heideman told Autolog. Performance and functionality was key, as was customer service. However, not every aspect of the expansion went to plan. In fact, the first task Heideman had to deal with was putting in a new 12.3 km, 44 kV hydro line for power, which was part of the overall $17-million bill. Now the line provides enough power for the new mill, as well as future expansion. Additionally, the company’s Yates planer mill, currently at their facility in Pembroke, Ont., was supposed to already be installed at the site in Eganville. The foundation is in place for the new planer mill just beside the dry kilns and air-drying yard, but the equipment will only be moved next year. But the delay in moving the planer mill may actually be beneficial for Heideman.The company originally planned to have two planers in the next three years, but “now that we have a few extra months to catch our breath, we may go with a new planer right away in the new building, and then use our existing planer in another building,” he explains. Finally, the resaw was not yet running when CFI visited the mill in late October, but it did begin operating by the end of the month. which includes adjustable riders built into the ladders. With the resaw up and running, the mill is expected to consume 215,000 m3, of roundwood compared to 125,000 m3, coming from both private and crown sources. “We will produce about 35 million board feet through the sawmills,” says Heidman. The company will also buy another eight to 10 million in lumber, both green and dry. With all of this new automated machinery, the company is expecting “significant recovery and yield gains.” In fact, “We’re already doing as much on just the Autolog optimized carriage as what we were doing at the old mill with a carriage and resaw,” says Heideman. The company can also do more value-added production and stack lumber for the kilns, thanks to the Piche sorter and stacker. And this increased efficiency has also impacted Heideman & Sons’ employee retention. Before the expansion, they had 19 lumber pilers. Now, they would need 30 lumber pilers to manage their output. The company now has 108 employees on direct payroll, and at least as many full-time contractors working in the wood supply and lumber supply chain. But the most significant change is the number of shifts the mill can run. In turn, the surrounding community of Eganville has felt the benefits. So the reaction from the community has been “very positive,” he says. Like all sawmills, the return on investment won’t be felt for years, but scrapping the older equipment (about 40 years old now) was necessary to continue thriving in the industry and attracting employees.